Haiti On Edge Amid Disputed Election Results A political standoff continues in Haiti after the Nov. 28 presidential elections. Two of the top three vote-getters are refusing to participate in the recount, citing "massive fraud" at the polls. 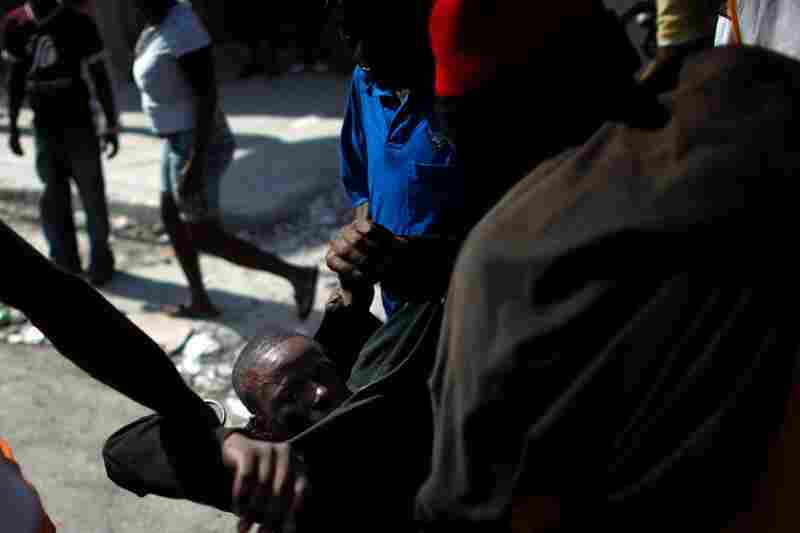 After riots, a tense calm has settled on Port-au-Prince as officials try to arrange a runoff. A political standoff continues in Haiti after the disputed Nov. 28 presidential election. Election officials have announced that they will recount the votes, and they have extended an appeals process for candidates who failed to make it into the Jan. 16 runoff. Two of the top three vote-getters, however, say they are refusing to participate in the recount, citing "massive fraud" at the polls. 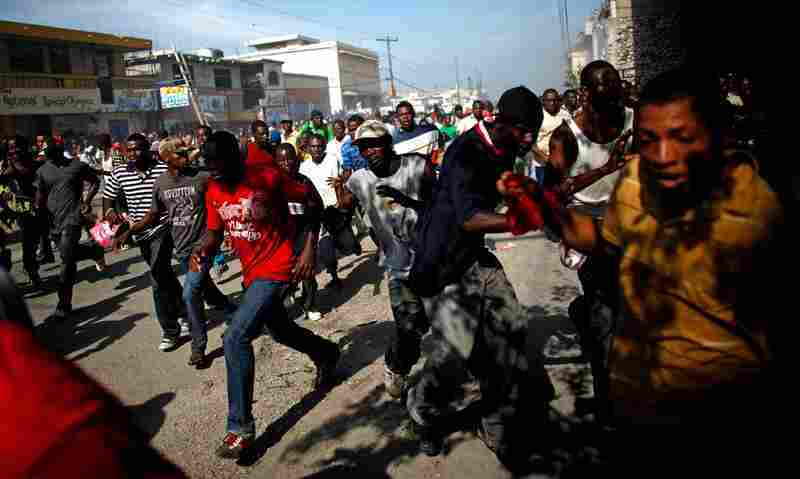 Last week, riots shut down Port-au-Prince. This week, a tense calm has settled on the streets of the Haitian capital. "Stuck. We are stuck. We are at an impasse," says Richard Widmaier, head of the independent media company Radio Metropole, summing up the state of Haiti's presidential selection process. The elections disintegrated into chaos on Nov. 28 when, after the polls had only been open for a few hours, 12 of the 18 presidential candidates called for the voting to be canceled. The candidates accused the ruling party of rigging the election in favor of its own candidate, Jude Celestin. When the preliminary results were released last week, 70-year-old Mirlande Manigat, a law professor and former first lady, emerged as the front-runner. 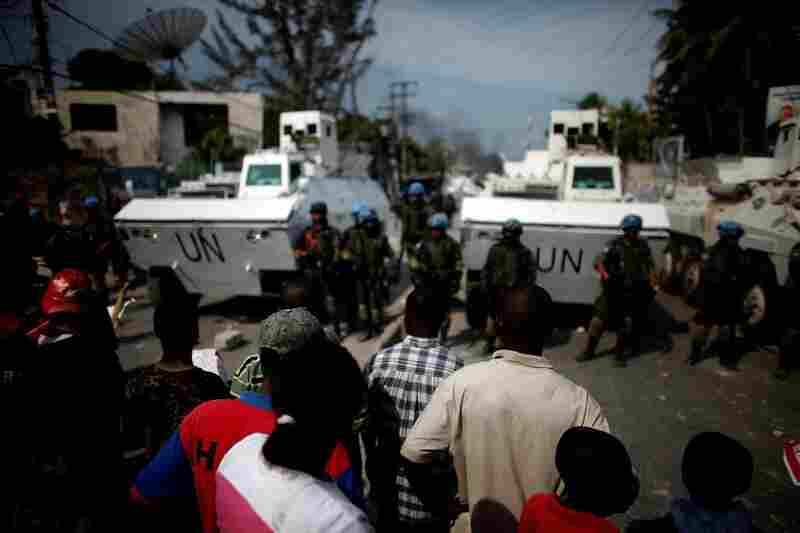 U.N. police make their way through the streets on Thursday in Petionville, a suburb of Port-au Prince. 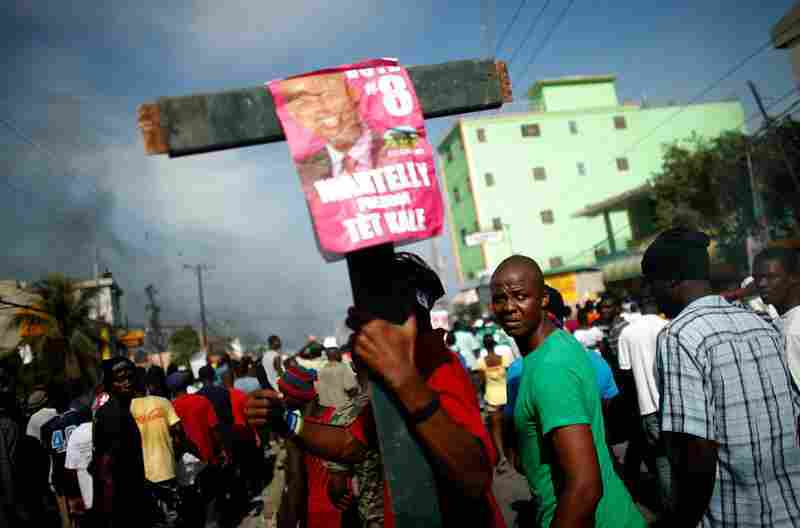 Supporters of Michel Martelly, Sweet Mickey" took to the streets of Haiti's capital for a third day to contest election results. Haitian election officials announced late Tuesday that two candidates — government protege Jude Celestin and former first lady Mirlande Manigat — would advance to a runoff. Michel "Sweet Mickey" Martelly greets his supporters at his home in Petionville. A popular singer in Haiti, Martelly failed to qualify for the runoff, placing third after Manigat and Celestin. 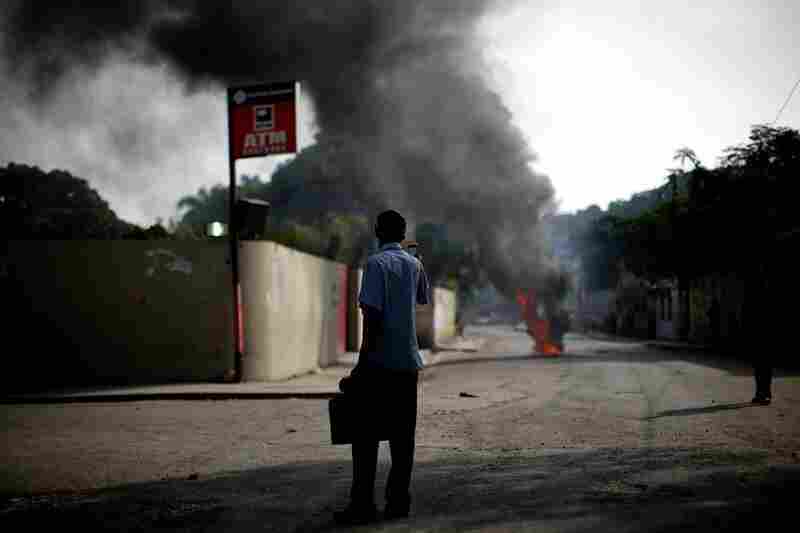 Protestors block the road in Petionville, a suburb of Port-au-Prince. Thousands of protesters demonstrated across Haiti on Wednesday over what they claim are rigged results of the Nov. 28 presidential election. 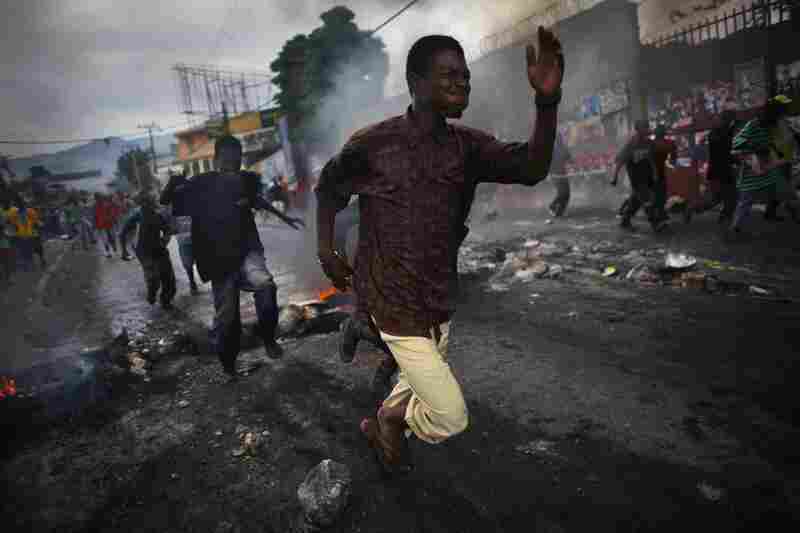 Supporters of Michel Martelly run from tear gas being fired by UN soldiers. 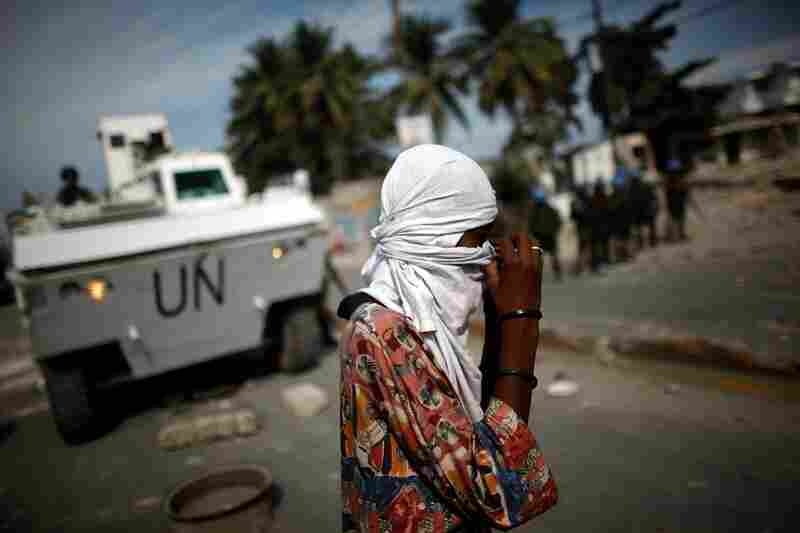 Supporters of Michel Martelly run from tear gas fired by U.N. soldiers. 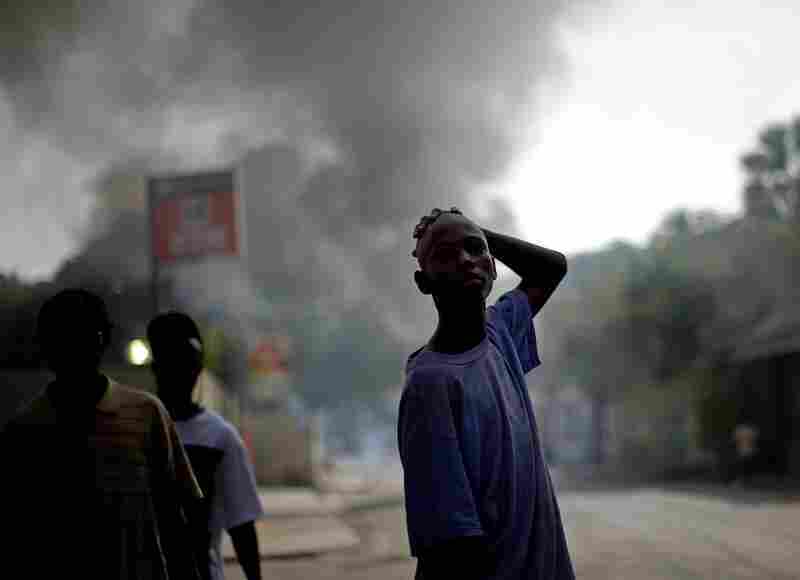 A boy looks down a ravaged street in Port-au-Prince. 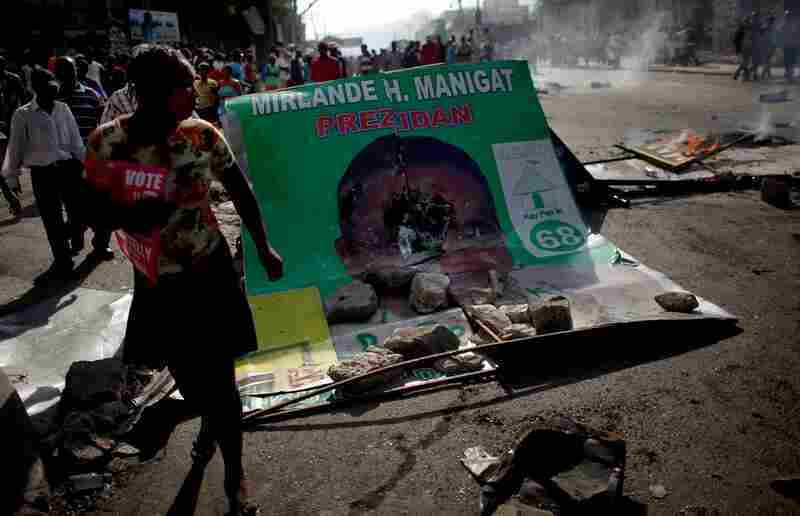 Martelly supporters take to the streets, walking past a smashed billboard of Manigat. 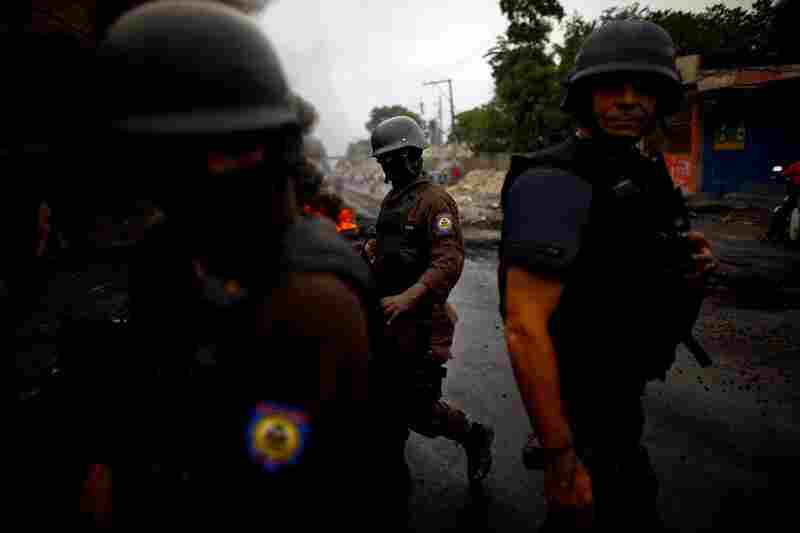 Martelly supporters confront Brazilian U.N. soldiers in Port-au Prince. The results were announced Tuesday evening after hours of delays and were questioned both in Haiti and abroad. The post-election unrest means more upheaval in a poor country suffering a cholera epidemic and still recovering from the devastating Jan. 12 earthquake, which killed more than 200,000 people. 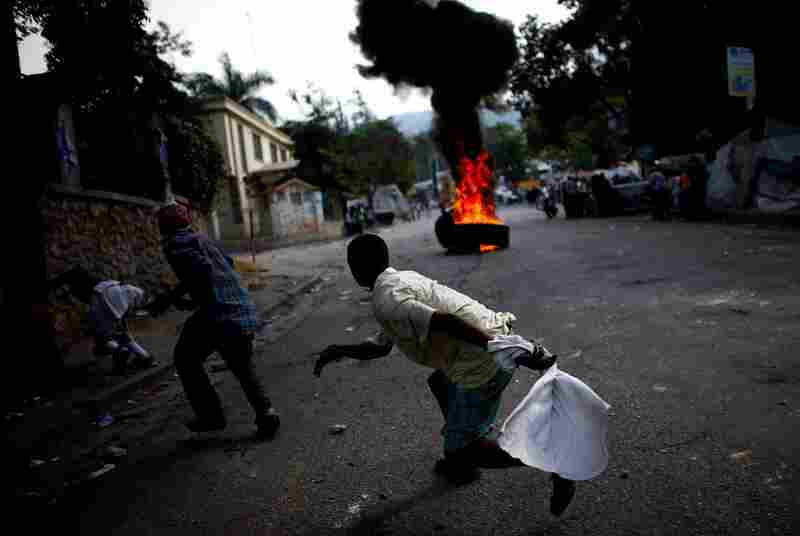 Martelly supporters run from tear gas fired from an election office in Port-au Prince on Wednesday. On Tuesday night, demonstrators set up flaming barricades near a restaurant in Petionville, a suburb of the capital where the tallies were announced, and threw rocks at passersby. Black smoke from burning barricades was in the air Wednesday in areas where Martelly's support is strongest, including Petionville and Delmas. Thousands were on the streets chanting, "Micky," and singing political songs. 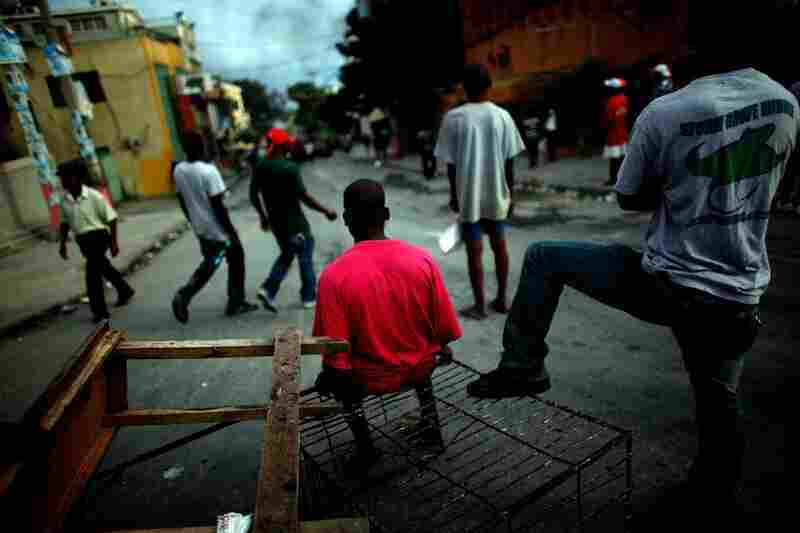 Protesters block the streets in Petionville on Wednesday. Martelly supporters claim that the Nov. 28 ballot was rigged to push the unpopular Celestin into the runoff election. The election results are preliminary, "so the candidates have 72 hours to protest the results; we are expecting that Martelly will do that," noted NPR's Jason Beaubien. The appeals period runs through Friday, with final results expected to be announced around Dec. 20. The runoff is scheduled for Jan. 16. 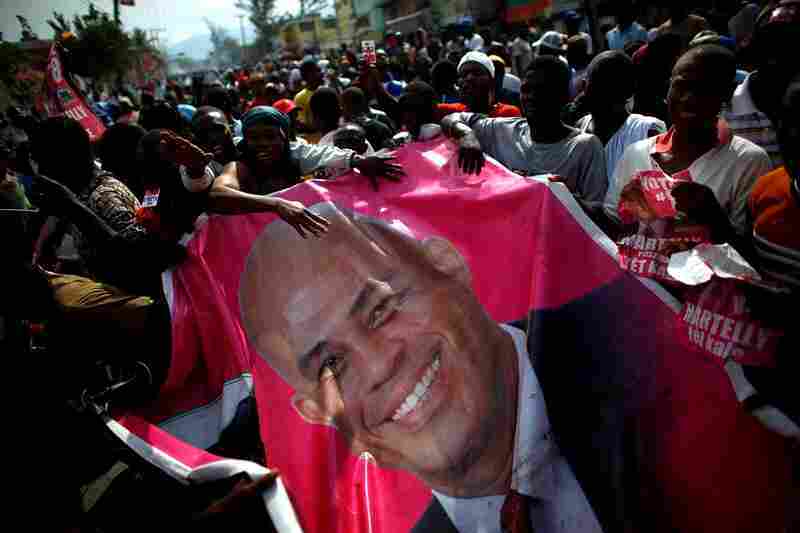 Supporters carry a giant poster of Martelly in a massive demonstration. Officials acknowledged that the election was imperfect, with hundreds of thousands of earthquake dead still registered and many living voters waiting for ID cards. U.N. peacekeepers and the joint Organization of American States-Caribbean Community observer mission say the election problems do not invalidate the vote. Here, protesters help an injured man who was hit in the head with a rock. A Haitian man takes a photo of the destruction with his cell phone. Protests began as soon as the election news was announced. 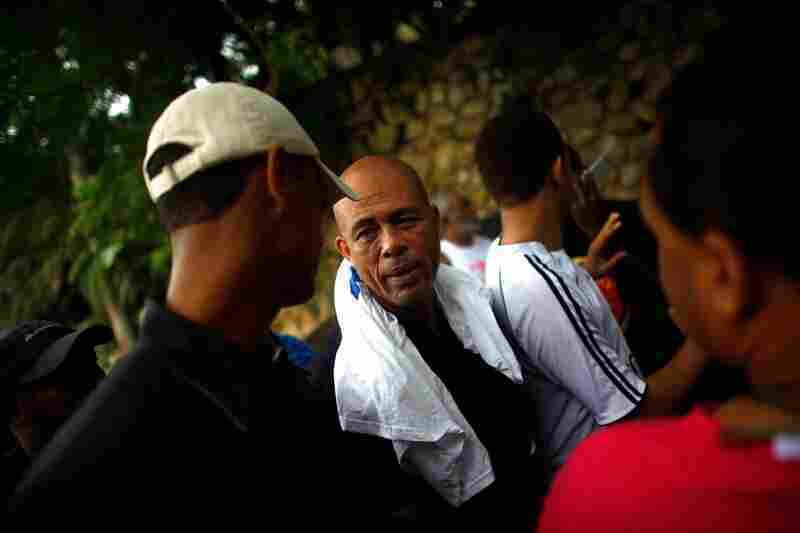 Supporters of third-place finisher Michel Martelly barricaded the streets of the capital for three days straight. Martelly finished just behind Celestin in the official results, and thus was eliminated from the second round of the race. "Six months ago, nobody ever thought Martelly would have any importance within the electoral process itself," Widmaier says. The 49-year-old musician known as "Sweet Micky" is now at the center of the political impasse. Martelly is proposing that instead of a runoff on Jan. 16, as currently mandated by law, Haiti should just redo the entire election. But Martelly says that first, the Electoral Council should be fired. "We don't trust those people anymore," he said in Creole. And he added that the council has lost the trust of the Haitian people. So far, President Rene Preval has stood by his election officials and hasn't made any indication that he'll appoint new ones. 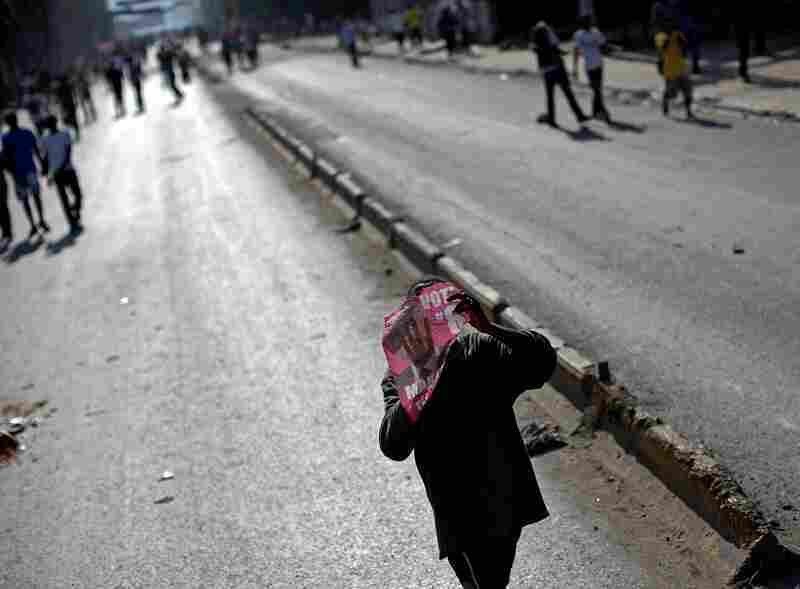 Last week's raging protests left at least two people dead, dozens injured and the streets littered with burned tires. Almost all shops and businesses were closed for three days. The capital remains on edge, with many people expecting the riots to resume. Preval has defended the election results and called for calm. On Sunday, during Mass at the Catholic Christ the King Church, the Rev. 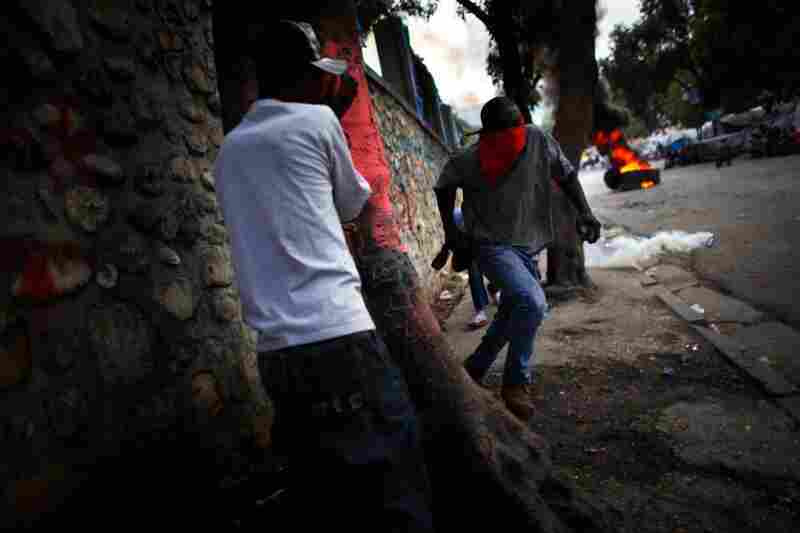 Richard Gerard denounced the violent demonstrations. Preaching in the shell of a grand church that was destroyed in the January earthquake, Gerard said Jesus never rioted in the streets. "How can we say that we are children of God, that we have been created in his image, while acting like animals of the forest?" he said. 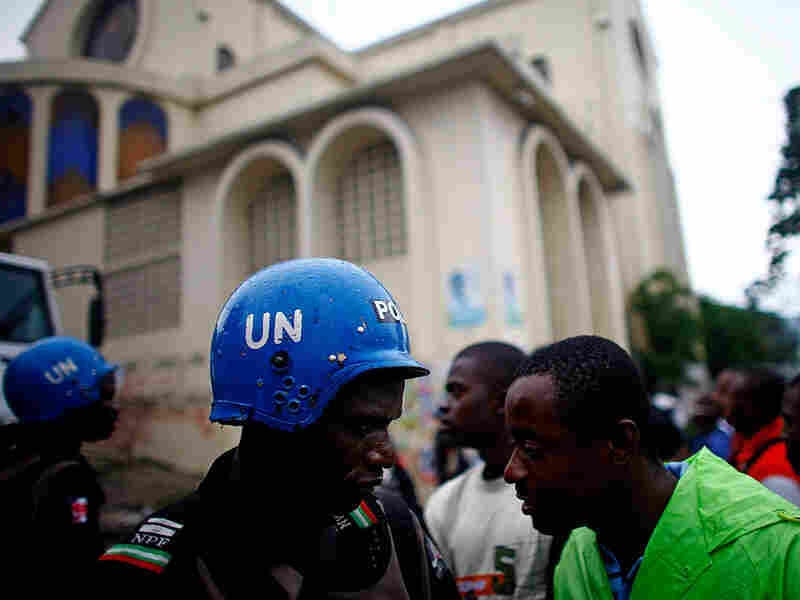 U.N. forces try to calm the crowd outside an election center in Petionville, a suburb of Port-au Prince, on Dec. 9. 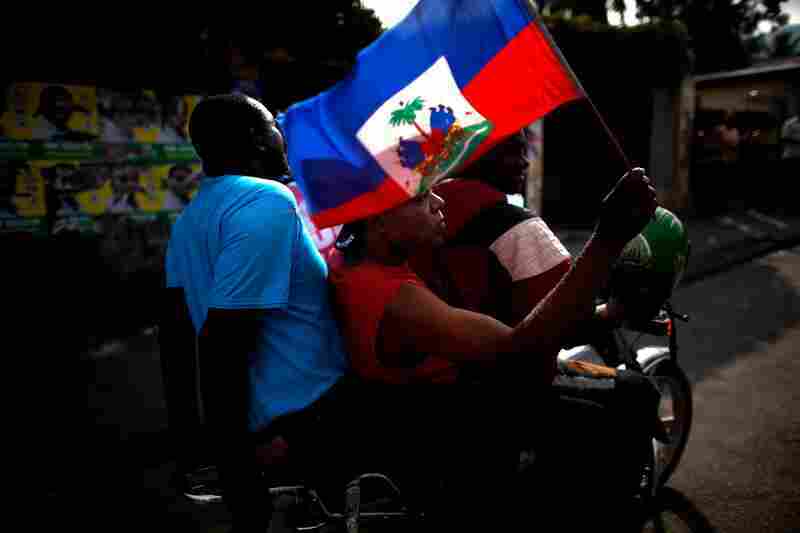 Supporters of Michel Martelly, who failed to qualify for an election runoff in results announced by Haitian electoral authorities, took to the streets of Haiti's capital in three days of unrest last week to contest the election results. This week, Secretary of State Hillary Clinton said the U.S. is "frustrated" with the Haitian government over the elections. She warned that Congress may cut international aid to the Preval regime if it fails to ensure the credibility of the polls. 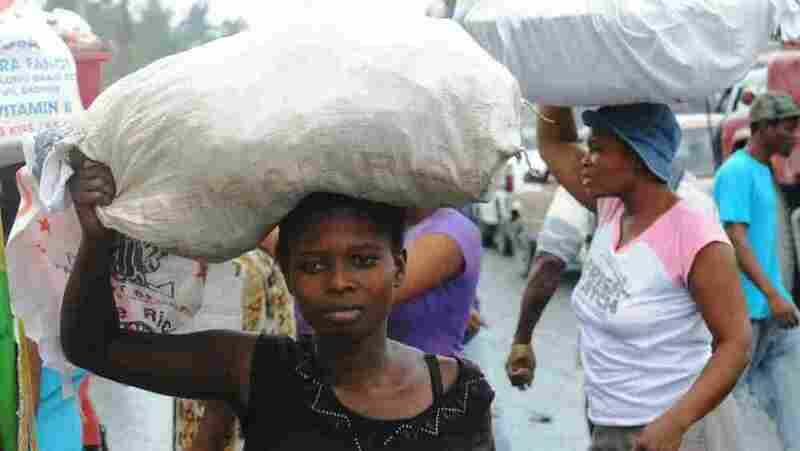 In Haiti, allegations of fraud and criticism of the balloting can be heard across the social spectrum, from vendors in the streets to business leaders. "The Haitian people, that's all they have as their weapon. They don't have economic power. They don't have social power. They have their ballot," says Reginald Boulos, the head of the Haitian Chamber of Commerce. Boulos says exit polls conducted by the Chamber of Commerce clearly showed that Martelly, rather than the ruling party's Celestin, should have made it into the runoff. Boulos says he is saddened that in the aftermath of the earthquake, Haiti is now also dealing with this political crisis. "We were expecting that everybody, including our government, would remember that 300,000 people died 10 months ago, would remember that 1 million people are still living under tents, and not do what we are seeing right again, trying to steal elections and not letting the people choose who they want as their leaders for the next five years," he says. He says that the next president is going to have to make some extremely difficult decisions about how to rebuild the country. Boulos says it's more important than ever that that person has the support of the Haitian people. But for now, it is unclear how the next president is going to be chosen.